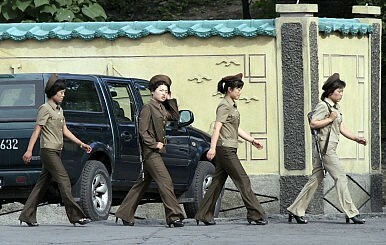 Kim Jong-Un’s wife, Ri Sol-Ju, has made high heels the new fashion trend for North Korean women. High heels have made it to the streets of North Korea, becoming one of the more popular fashion items in the country, the Japan-based pro-North Korean media outlet Choson Sinbo reported on July 30. Ri Mi Ok, a female manager at the Potonggang Shoe Factory, told Choson Sinbo that North Korean women wear very high heels, and stores carry a diverse selection of styles. She added that women refuse to wear heels less than 5 cm (2 inches), and even the men, especially the younger ones, wear shoes that have high platforms. As Daily NK points out, Kim Jong-Il used to wear platform shoes. However, as one source pointed out to Daily NK, the new trend towards women wearing high heels is likely being influenced from the top. “Pyongyang women are influenced by Ri Sol Ju [Kim Jong-Un’s wife] and the Moranbong Band, so they like to wear strappy heels,” the source said. According to Choson Sinbo, the Potonggang Shoe Factory first opened in the 1960s and is now the largest show manufacturer in North Korea, with nationwide distribution. It has around 950 employees and eight professional designers, producing 50 different types of shoes including special ones for disabled people. “Sure, high heels are popular [North Korea]: most urban women are concerned with looking feminine, and high heels are a part of that package,” said Andray Abrahamian, Executive Director at the Choson Exchange, a Singapore-based NGO that trains North Koreans in economics and business, teaching them skills like customer service and marketing. He told The Diplomat that he hadn’t heard that any high heels were being made domestically, but that this would be consistent with the government’s desire to substitute imports with locally produced goods. Meanwhile, The Guardian reported on April 22 that in North Korea there is what one might call the fashion police, who monitor and control North Korea women’s outfits. According to the paper, the fashion police are actually unpaid members of the government-run Kim Il Sung Socialist Youth League and Pyongyang’s use of those people underlines its determination to control every aspect of people’s life. However, The Guardian said Pyongyang’s efforts doesn’t stop some trendsetters from pushing the boundaries.